This may represent the very first issues of the expansion of the Islamic Empire into former Byzantine territory. 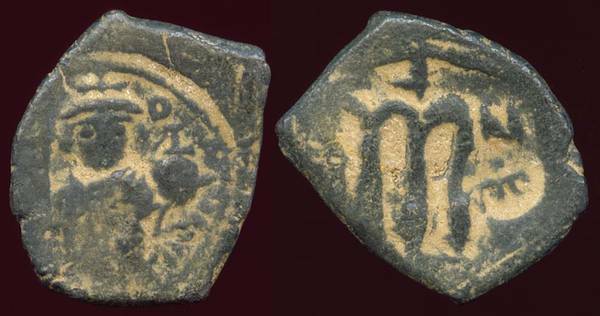 This follis of Byzantine Emperor Constans II has had an Umayyad Counterstamp applied. OB: Constans II standing holds a staff with Chi-Rho on top in his r. hand and a globus crucigar in his l. hand. RX: large 'M' signifies a 40 nummis or Follis. Umayyad countermark in the right field. V. Scarce.